Terrain For Hippos in association with The Campaigner is proud to bring you the TERRAIN CRUSAD COMPETITION! "Now you can have the talents of The Campaigner’s resident terrain expert, Owen Top, among your own collection. 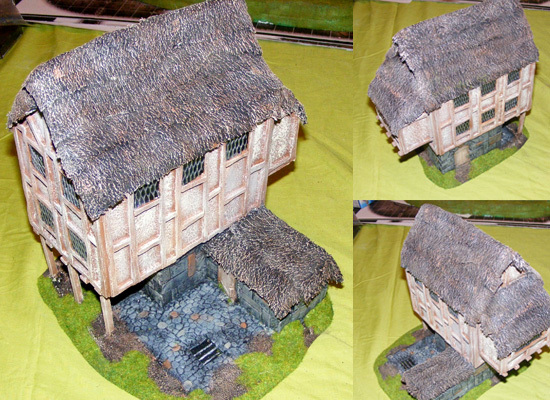 The building Owen created for last issues Terrain Crusade is up for grabs. But it can’t go to just any home, it has to be won by Owen’s most learned student.The challenge is to show Owen what you have learnt by creating a piece of terrain. It can be any size, but must be on a circular base 120mm in diameter (the size of a compact disc… how about that) and can fit any genre, theme or game system you like. The more creative and skilful the more you are likely to impress Owen. Once completed you can send your entry to contact@thecampaignermagazine.com. Include your name, up to five photos showing the terrain piece from different angles, as well as a brief description on what the piece is and how you built it. Owen will choose the entry he most thinks fulfils the ideals of the Terrain Crusade. Entries close Friday 25 March. One entry per person. Entry is available worldwide.